In 1973, English statistician Francis Anscombe created a quartet of graphs to plot four nearly identical datasets. He didn’t do this to solve a problem, but rather to prove a point. While all four graphs are based on similar information, each depicts a vastly different conclusion when translated to a visual medium. 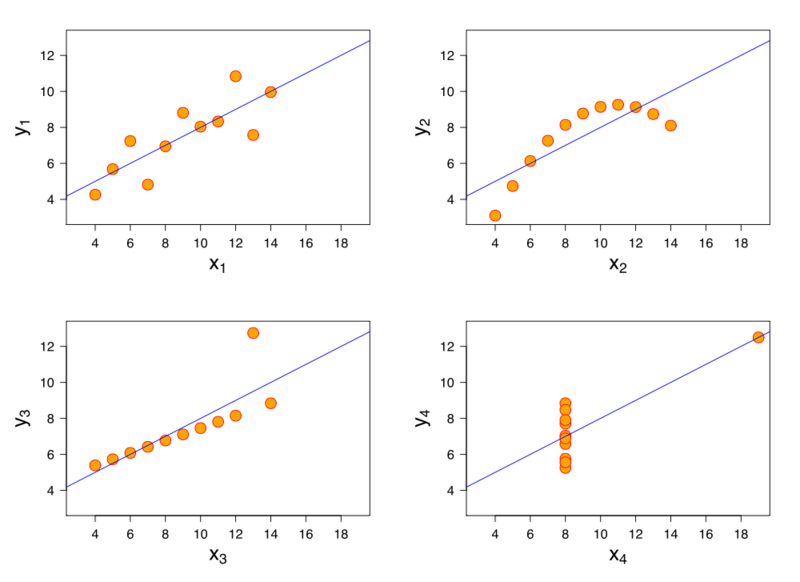 In the field of statistical analysis, Anscombe’s quartet serves as a reminder that, to truly understand data, you have to see it in action. Today, data visualization is essential to the way we do business, as well as to our understanding of the complex information that fuels our daily lives — from the mileage on your car, to the maps on your GPS, to the eye-opening infographics you share on Twitter. Technically speaking, data visualization is simply the representation of raw stats and facts in an illustrative form that shows why that info is important. But in truth, data visualization is a process that turns cold, hard numbers into powerful, memorable stories — and that’s exactly why professional services companies, especially consultancies, need it. Those consultancies are tasked with assessing their clients’ various (and at times, conflicting) goals and priorities, studying past performance and future projections, and using those findings to provide simple solutions that will drive results. More often than not, that means delivering complex information and pragmatic advice to C-level executives who may or may not be ready to hear it. Whether the audience is a perpetually distracted, thirty-something CEO at a startup, or a frazzled banking CTO who can barely spare 15 minutes for a meeting, they’re still humans — and humans crave visual storytelling. Data visualization achieves its power by turning the executives and their companies into the main characters in a story, and then showing them how those characters can triumph in the end. “Data visualization is effective because it shows them what could be,” says Aquent’s VP of Professional Services Sean Correll. While data visualization duties can be split up among a team of designers, programmers, and data scientists, more and more professional services companies are employing specialists that bridge the disciplines. That’s no small feat. “Data scientists dig into actual data and provide insights into trends, or explain why something is happening in a particular business, but they’re not always the best at presenting it in a visually pleasing way,” Correll says. That’s where designers come in, but they don’t always have the necessary data-science background. On top of that combination, dedicated data designers should be able to hold their own in a meeting. “The high-end firms want people that are personable, and that can present to clients with confidence. The role fits the definition of a ‘unicorn’ in our world,” Correll says. Finding these qualifications within an already limited pool of applicants can be daunting for an internal recruiting department, but Correll insists he and his Aquent team know where to look. “They’re usually already working at premier clients that develop the talent and keep them in-house,” he says. With a seasoned workforce solutions provider brokering the deal, these high-quality candidates can be can be sold on your organization's core values and vision for the future. The accessibility of tools like Microsoft Power BI and Google Analytics makes it easier than ever to translate data into powerful graphics. This begs the question: Why hire a data visualizer at all? Why not just train existing staff or hire freelancers that can know how to use the software? While landing the perfect data visualization “unicorn” may be tough, it’s worth the effort. The curious, creative sensibilities of a designer and the scientific, investigative abilities of an analyst will find the stories buried inside your clients’ data. This talent will help your firm step up its data game, honing your analytical models until they’re practically airtight. Then, using powerful visual presentation, these hires will help stakeholders draw emotional connections to those stories — leading to growth for client and consultant alike.